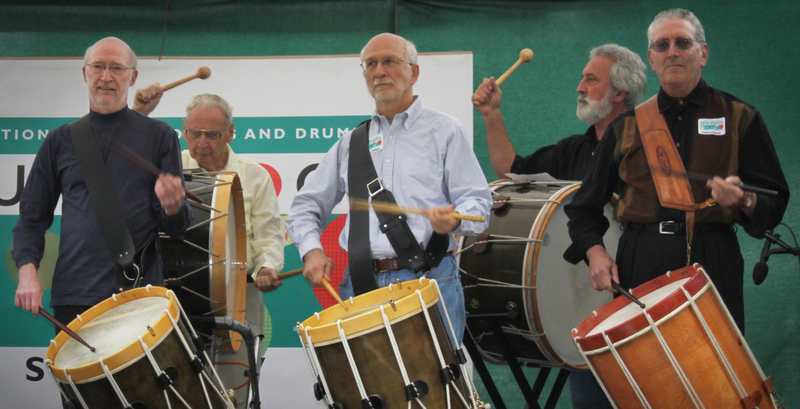 The 2011 Drum Boogie Festival was a huge success thanks to the wonderful performers, sponsors and volunteers. We were able to give $3000 to Family of Woodstock for the Kathy Janeczek Memorial Fund which will benefit Breast Cancer Treatment in the Hudson Valley as a result of the fundraising effort organized by the Woodstock Chimes Fund which produced the free festival. Bread Alone, Walters-Storyk Design Group, Precision Flow Technologies, Markertek.com, Woodstock Chimes and Two Boogie Friends were the major sponsors while additional support came from Stewart’s Shops, Steve Weiss Music, First Niagara Bank, the Community Foundations of the Hudson Valley, Ulster Publishing, Herzog’s Home Center, Arthur Anderson, Miller/Howard Investments and many more. Local restaurants and distributors supplied food and beverages for the performers throughout the day. Interage Media Works sponsored the website and provided beautiful graphics for marketing the festival. Family of Woodstock supplied volunteers, SUNY Ulster students and Woodstock Percussion employees served as stage hands and Nancy Donskoj opened her house to the performers and staff. Live Sound, Inc. of Troy provided a brilliant sound to the festival. The president of the Ulster County Chamber of Commerce Ward Todd was the perfect emcee with his mellifluous voice. Many thanks go out to all of these individuals, businesses and groups, without which, great community events like this would not be possible. Cornell Park is an absolute gem of a venue for concerts with its amphitheater like setting, great acoustics, view of the Hudson River and access to wonderful shops and restaurants. I hope the powers to be decide to build a permanent stage to encourage more events. Check out our website for photos and updates of the festival: www.drumboogiefestival.com. We welcome continued financial support to help with the cost of the festival. Thanks again Hudson Valley for your enthusiasm and support. Boogie On!